A dreamy and creamy, dairy free comfort-style soup this winter! 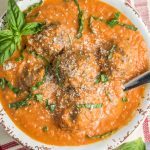 Tomato basil bisque with Italian meatballs is an amazing paleo and Whole30 compliant dinner with very little prep and takes just minutes to make. It’s too good NOT to be on rotation! I have big dreams…about upping my game with outdoor holiday decor. Do you know how it feels to drive through your neighborhood when every has their spooky lights and ghosts hanging from trees, then pumpkins and gords all over their doorsteps, then Griswold-style Christmas yards – and you pull into your driveway to like, one little wreath hanging on your door? It’s sad guys. One day I WILL join forces with the festive people. One day. But today is not my day. And he’s correct. That’s what the men are supposed to do, right? Engineer a light show perfectly timed to Jingle Bell Rock, with Santa riding a dinosaur-leading sled team, complete with a fireworks display at the end that reads “Merry Christmas!”. Honey, I’M NOT ASKING TOO MUCH. I gave birth to our kids. So the 2017 holiday season may not mean a yard mistaken for an amusement park, but it does mean warm and comforting dinners. I got that in the bag. 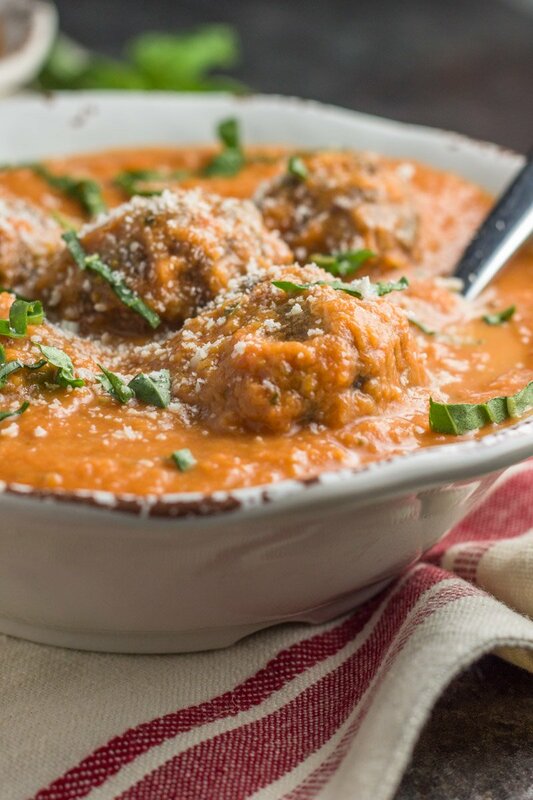 What could be more festive that eating this tomato basil bisque with Italian meatballs while watching every single holiday movie scheduled on the Hallmark channel? It’s better than a giant outdoor reindeer constructed of PCV pipe and says, “Feliz Navidad” over a loudspeaker. 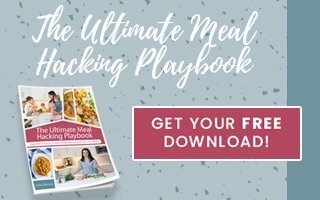 And when a comfort-style meal is paleo, Whole30 compliant, and made with MINIMAL effort, you’ll have time (and energy) to wrap your house with lights four times over. Forget roasting the tomatoes and stewing them for hours on end. 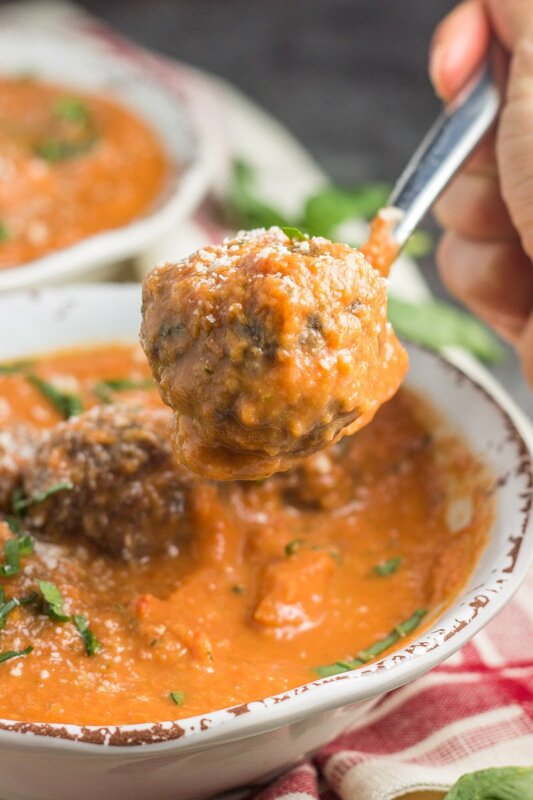 I took a few shortcuts to make this simple tomato basil bisque with Italian meatballs easy for the overwhelmed-holiday-mom. And those meatballs you ask? Just a few dried herbs with ground beef – baked in the oven in less than 15 minutes. BOOM. I mean, HAPPY HOLIDAYS you filthy animal toddler. I know, I know, I’m missing the ground pork in this recipe – but it’s really not necessary. Promise. But add it if you wish! I’ll never hold it against ya. 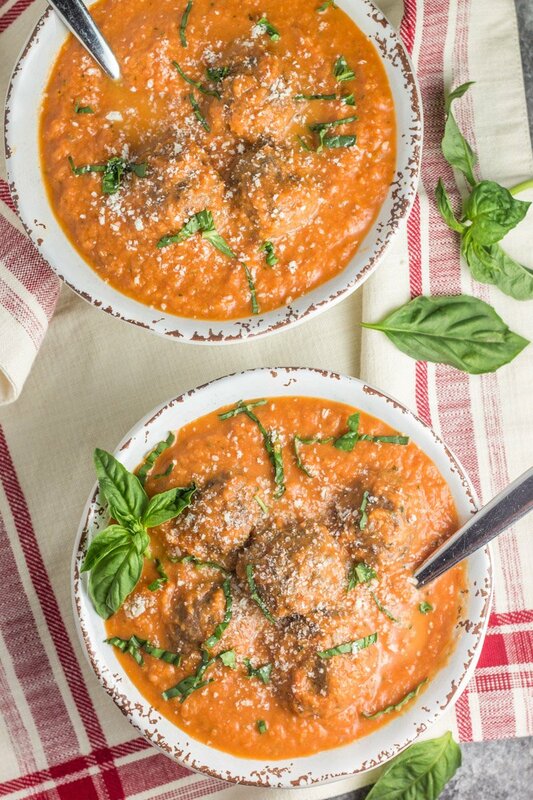 You’re bound to love this dairy free tomato basil bisque with Italian meatballs. Simple ingredients, big flavor, made for bellies in both the north and south poles (and everywhere in between). Here are some other comfort soups to warm your soul this winter! Freezer-friendly Whole30 slow cooker beef stew, skinny fiesta chicken soup, white bean and potato salmon chowder, hearty Midwest vegetable stew, and this parsnip leek butternut squash soup. 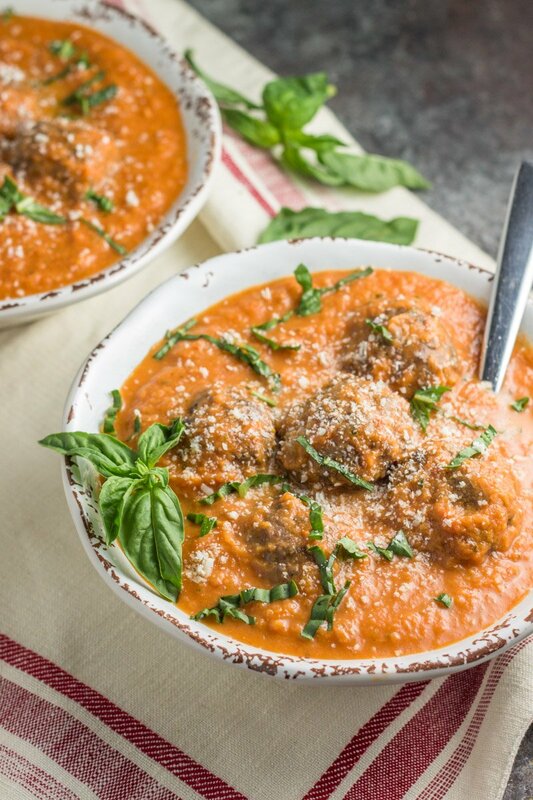 A dairy free and Whole30 compliant comfort-style soup packed with flavor and hearty meatballs! Just found what I’ll be making the night my in-laws arrive in town in a few weeks! Thank youuuu! Awesome!! I hope they all loved it Erica! This had me cracking up. I use the birth card all.the.time. Made this for dinner tonight and it is SO delicious!!! Love how easy it is too! Glad you liked it Caitlin! I made this for dinner tonight and it was amazing!!! Great flavor!!!! Glad you loved it Shari! Made this yesterday for dinner. Hubby and I loved it! I did add in some garlic and a splash of white wine. I also cooked everything together, then used my immersion blender. Easy and tasty! Thanks for sharing. I’m so happy to hear that Danielle! Great additions! Turkey and pork should work great too! Thanks Laura! This does not turn out like the picture at all. Does not turn creamy and pink with 1/3 c coconut milk. The flavor is not good of this sauce. I was disappointed. Doctored it up. Sorry this didn’t turn out as you wished Liz! Feel free to share how you doctored it up for anyone reading. And as for the photo – my food is styled and shot in specific light as most food photographers do, so sometimes getting the same ‘look’ is hard to achieve. Mine turned out looking almost exactly like the picture, but I added half of a can of coconut milk, which is more than 1/3 cup. I also use two leeks cause I love leeks. Flavor is amazing! Glad you liked it Christy. Thanks for the feedback! Definitely the can. It always has the nice cream on the top (which is what makes the dish so creamy and delicious!). So glad you are digging my recipes! I’m SO happy to hear this Laura! Thanks! Hi there! I have a severe allergy to any and all things cocout, is there something I could sub in for the full fat coconut milk that wouldn’t totally change the consistency of the soup? 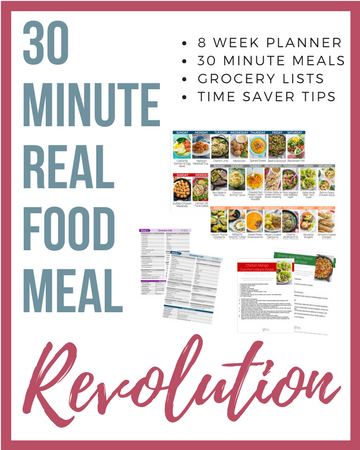 I’m new to this Whole30 life style but so far I’m loving it and have used a couple of your recipes already! You could try almond milk, but it won’t be as thick and creamy! That’s my best suggestion. Made this delish meal last night for dinner. Only my hubby, oldest and I ate the meatballs but we all (five of us) ate the soup!!! I did add some salt to the soup and cracked black pepper to mine but overall everything was delish! And it was my 1st time making meatballs…so easy and so good! Who knew?!?! Awesome Rebecca! I’m so happy to hear this! I’m so excited to cook this tonight – do you by chance have the nutritional info on this meal? I’m sorry, I do not! Just made this for dinner. Easy and delicious! If I give you photo cred and direct to your blog, may I use your photo for an IG post? I like to share great recipes. Sure Valerie. Thanks for asking! I don’t have any fresh basil would dried work? 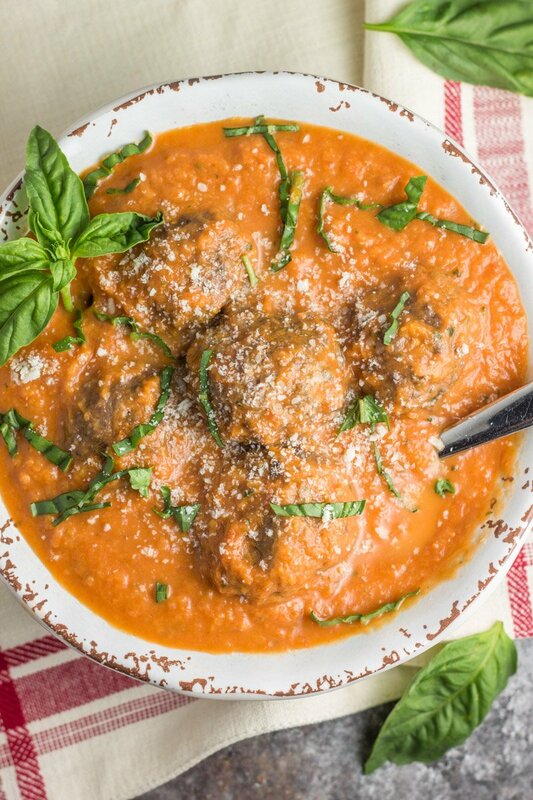 I wouldn’t used dried basil for this recipe – definitely fresh. This was absolutely delicious!! I’ve made it twice this week!! So happy to hear that Becca! Delicious, & husband approved! I had some sprouted grain toast with it to sop it all up. Whoo hoo!!! Awesome to hear! I have never had the canned coconut milk. Does it add a coconut taste at all? It does have a slight coconut taste but I can’t detect it in this recipe because the basil and tomato flavor overpowers it! I’m planning to make this tonight but I don’t have any leeks. Can I substitute onion? Or green onion? A yellow onion will work just fine. Green would too! Could you describe how to cut a leek? I think I added in too much of the green part . It still tastes ok but would just like clarification. Thank you!! I usually start in the middle and definitely include all the white (that’s where all the flavor it). Slicing it thinly is best. This recipe is great! So simple and delicious. I also like to add a roasted red pepper to mine. Tonight I’m making just the bisque without the meatballs. Thanks for a yummy recipe! Oh love the roasted red pepper idea! YUM! Can this be made a head of time and frozen? Trying to prep my meals on the weekend. My guess is yes – I actually have a batch in my freezer but I haven’t yet defrosted and tried it! Would this recipe be ruined without the leek/onion addition? My husband can’t eat them. Any chance I can sub ground chicken in for the meatball recipe? thx!